Blandford Forum is a market town in north-east Dorset. The attractive Georgian architecture and the neat lay-out of the centre of the town are the result of a devastating fire that started on the 4th of June 1731. 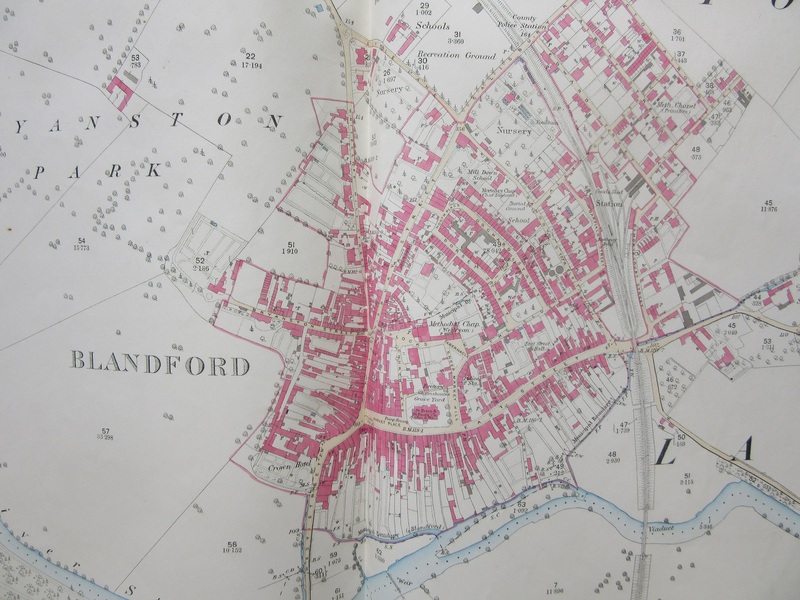 This map, printed soon after, dramatically shows the condition of the town in the immediate aftermath of the blaze, all the dark shaded buildings were destroyed leaving few still standing. The box at the bottom tells the story. Starting in a tallow chandlers house (A on map) at 2pm the fire soon spread to the houses between the chandler’s house and the church (B) before spreading to the properties across the road. The text ends ‘The church by the care of some of the inhabitants was preserved till about 11 at night tho’ the spire which was now covered with lead took fire within side about 4 in the afternoon which was soon extinguish’d but the fire flying over and thro’ it at every crevice, some sparks whereof lay latent till about 2 in the morning, then broke out in the middle isle under the lead, where ’twas impossible to extinguish it without engines which were already burnt many hours before, & the inhabitants so tired with much fatagues that before morning ye church was entirely destroyed ye poor remains being scarcely fit for a foundation’. 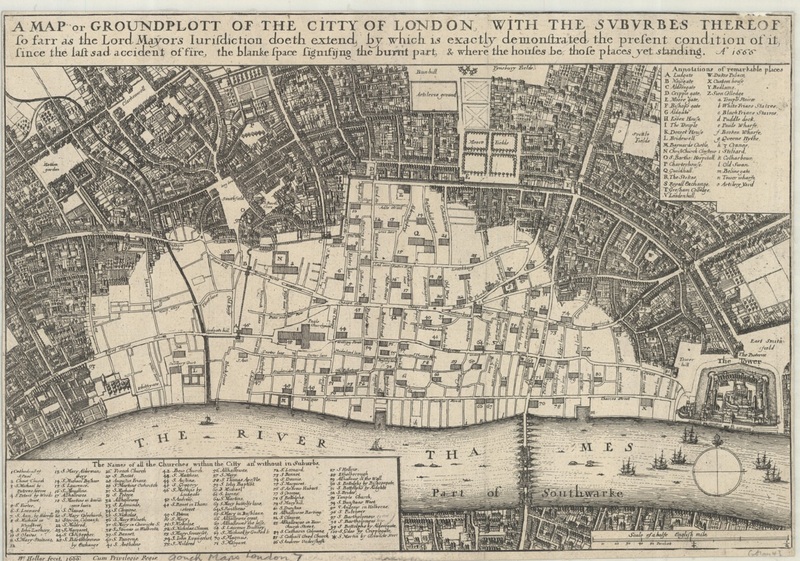 The most famous of urban fires though is the Great Fire of London, which fanned out of Pudding Lane late in the evening of the 2nd of September 1666 and soon consumed most of the buildings within the old walls, as these maps of the damage show. London has a long and painful history of great fires, from the destruction caused by Boudicca in AD 61 to accidental fires in 961, 1087, 1135 1299, 1444, 1561 1619, 1698, 1716, 1725, 1748, 1814, 1834, 1838, 1861, 1874, 1882, 1917 and 1936, and these are just the major fires, there have been many smaller but damaging accidents as well. The above is one of many different designs for the rebuilding of the city after the great fire. Proposed by Valentine Knight the scheme called for a rigid street pattern but with a greater amount of water in the shape of a canal flowing through the city. This map was printed a remarkable 18 days after the fire started. 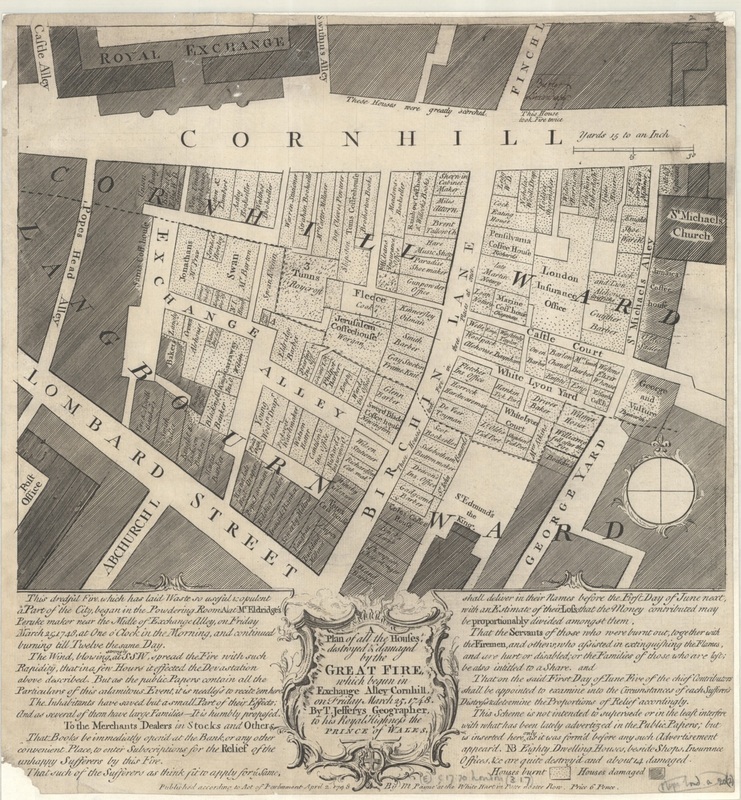 Despite further plans submitted by such notable figures as Sir Christopher Wren in the end a design based on the old lay-out was implemented, but with greater distances between houses and set rules on building materials. 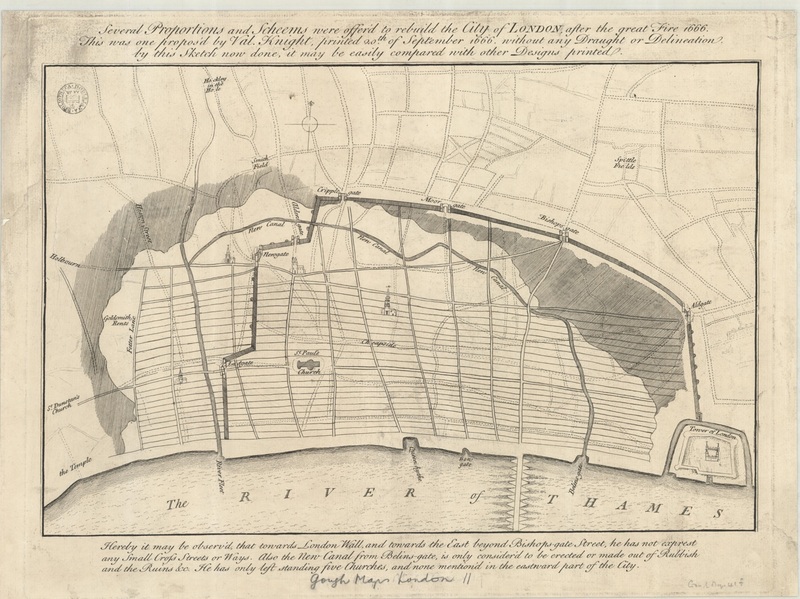 A map of another of London’s great fires, that of March 1748. As with the map by Valentine Knight this was produced very quickly after the incident, a mere 8 days between the fire and publication. 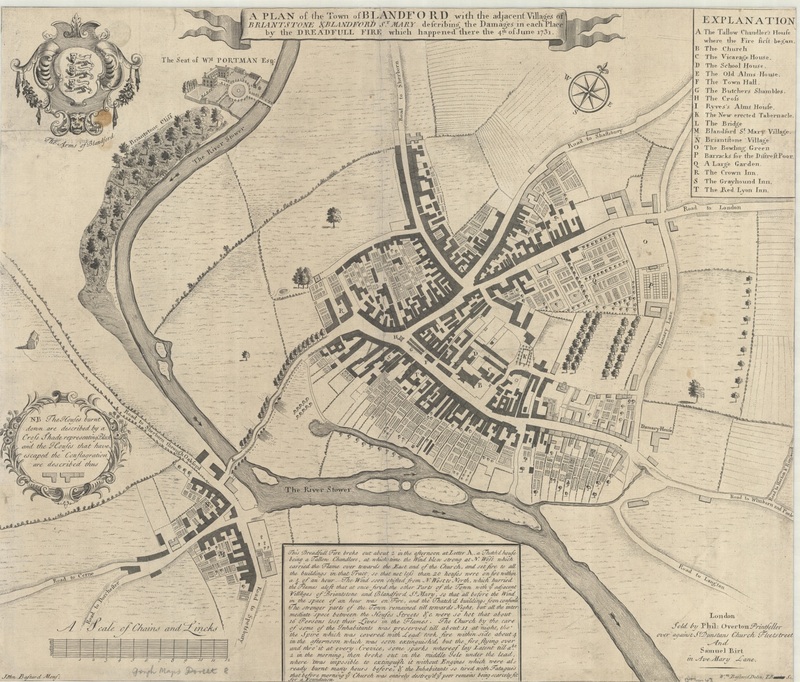 Finally an inset from ‘An exact surveigh of the streets lanes and churches contained within the ruines of the city of London…’ (1669 (E) C17:70 London (643) which shows the fire from Southwark. This entry was posted in Uncategorized on 4 June 2018 by stuart.